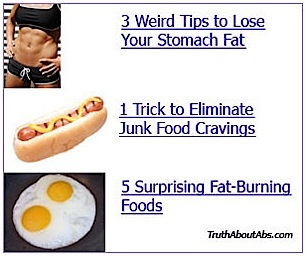 You are currently browsing the Fat Cyclist weblog archives for March, 2010. Well, what they actually say is, “You have waaaay too much time on your hands,” but I am quite sure that what they really mean is what I have written in the above paragraph. So: Let me give you a little peek into the very chic and glamourous life I lead, which will also serve to explain why I am writing this post today. What many people don’t realize is that — even though I am very famous and beloved by millions (or, possibly, by fifteen people who clear their cache and reload the page quite frequently — I don’t pay much attention to stats), I still have a full-time job. That’s right, the blog does not make enough money for me to live on. However, it now pays for my monthly electric bill and my internet service, so things are looking up. So I generally have two opportunities to write during the day. The first comes early in the morning — I get up around five or so, and work on this blog ’til 6:30, at which point it’s time for me to get the kids moving and off to school. Sometimes I’ve finished writing my post for the day, sometimes I haven’t — in fact, sometimes I’ve barely started, re-started, discarded the re-start, and then gone back to my original idea or resorted to working on an abandoned post I had given up on during a previous writing session. If I haven’t finished writing, I have a second chance: lunch hour, during work. I also generally have a third chance: I can write instead of ride, during whatever riding window I have available during the day (this window is different on different days). But I do not like to use this third chance; if I choose to write about riding instead of getting out and riding, something feels seriously messed up with my priorities. Today, though, things didn’t go so perfectly for my blog. I had a 5:30am meeting, wherein I mostly listened to other people talk about a position I might be suited for in the newly-acquired company. Since I hope to remain employed, I found this discussion deeply interesting. That pretty much took care of my early morning writing time. Then, upon waking, one of the twins told me she was sick, complaining of a headache and a cough. And she had a fever. Since these are the identical symptoms two of my other kids have — within the past couple weeks — started with a day or two before being diagnosed with Strep, I connected the dots and kept her home, setting up a doctor appointment during my lunch hour for a Strep test. There. Just like that. My two chances to write. Gone. Almost as if I were subject to the normal interruptions and problems of you normal people. PS: I did find fifteen minutes to write this whiney little post, though, didn’t I? A Note from Fatty to Utah Participants in the 100 Miles of Nowhere: If you’re in Utah County or SLC, why don’t you come do the 100 Miles of Nowhere with me? There’ll be food, fun, movies, the guy from Ride the Divide, and probably some cool giveaways. Send me an email right away, letting me know you’re interested. I need to get a headcount. The St. George Ironman is barely a month a way, which means I should probably start training for it sometime within the next three weeks. Ha ha! I’m just kidding, of course. I’m hard at work, training for the Ironman. Otherwise, how can I possibly hope to win it! Specifically, I am concentrating on my transitions. For those poor saps out there who don’t know what a triathlon “transition” is, let me explain. The transition is the part of the tri (those of us in the know call the noble sport of triathlon “tri”) where you stop doing one sport, change into a new outfit, and then begin the next sport. Transitions are widely known as the third most exciting part of a triathlon. Partly because there’s a good chance you’re going to see someone naked, partly because everyone’s so agitated and panicked that they tend to bumble about comically, tripping in their shorts and putting their shoes on the wrong feet. By the way, in case you’re interested, the second most exciting part of a triathlon is the start of the swim, because that is a huge, bloody battle and a fun place to make bets on how many racers, after the start, are left stunned and bobbing facedown in the water, having received a debilitating kick to the head. A well-executed transition can happen in under two minutes, while a poorly-executed transition may take up to two and a half minutes. Which can totally make all the difference. And that is why I have begun devoting ninety minutes each day to doing transition drills, developing my skills and technique. The Onion Method: I begin the day by putting on my running shorts and shirt. Over this, I put my bib shorts, then cycling jersey. Then my socks: a pair of running socks, covered by a pair of cycling socks. Then my cycling helmet, covered with a swim cap. Then, finally, my wetsuit. Then, as I finish each porition of the event, I merely peel off a layer, put on the appropriate shoes, and go. So far, the only problems I have are chafing, getting the wetsuit over all these clothes, and the fact that I am completely immobile and lose circulation to my arms and legs with this getup on. Which are minor problems, really; I’m pretty sure I can work them out..
Go for Simplicity: While both my above solutions are excellent in their own right, I’ve been considering just doing the entire race — the swim, the bike ride, and the run — in my awesome Aqua Sphere Icon Wetsuit. For one thing, I would save a huge amount of time otherwise expended in stripping the wetsuit. For another thing, I look and feel like a superhero in that wetsuit and would intimidate other competitors if I were to wear it. Especially if I wore a cape (a short one for the ride to keep it out of the moving parts of my bike, a longer cape for the run, so it would billow more fully). Best of all, I think I would lose about 80 pounds by wearing the wetsuit through the entire Ironman, so would finally be able to stop dieting. Naturally, my transition strategy — no matter how brilliantly conceived — won’t work if I can’t execute it flawlessly. To ensure that I will be able to save the precious seconds in my race, I have begun serious training (all triathlete training must be conducted seriously) in transition speed and endurance. For example, this morning I did 15 “reps” of transitioning from my wetsuit into my biking clothes. And I am exhausted. I tell you what: I have totally new respect for triathletes after that. Tomorrow, my workout will be all about transitioning from cycling to running gear. Because this is an easier change, I plan to do “speed transition drills,” changing back and forth between cycling and running clothes up to 50 times. And on Saturday — my long workout day — I hope to do transitioning “bricks,” where I change from the wetsuit to cycling clothes, then to running clothes. I will repeat this transitioning workout until I am simply too tired to zip up the wetsuit anymore. This is ambitious, I know. But I — like all triathletes — am very serious about my transitioning. In fact, I am so serious about my transitions, that I am focusing on them exclusively, figuring that if I can change clothes and get out on the course as fast as possible, the rest of the Ironman — the swimming, biking, and running parts — will kind of take care of themselves. I can hardly wait for the transitions to begin! PS to 100 Miles of Nowhere Participants: You know how I said that participants in the 100 Miles of Nowhere would get a Banjo Brothers Mini Seat Bag? Well, the guys at Banjo Brothers took a look at their inventory and found that they don’t have 500 of that Mini Seat Bag. So — awesome guys that they are — they’re instead going to give participants the Deluxe Mini Seat Bag. It’s the same size, but comes with better construction and little pockets that make it easy to organize the stuff in the bag. Huge thanks to the Banjo Brothers guys for taking a little problem and turning it into a big win for the 100 Miles of Nowhere participants. A Get-Em-Before-They’re Gone Note from Fatty: Registration for the Third Annual 100 Miles of Nowhere has been selling pretty darn briskly. So darn briskly, in fact, that by the time the Twin Six guys went to bed, there were just a few dozen slots left. Rather than leave registration open overnight and wind up overselling the event, they suspended registration for the evening. But it’s open again, right now. Men, register here. Women, register here. There are fewer than 40 slots available at this point, and I’m certain they will sell out within an hour or two. So if you’re going to register, do it now. Update: The 100 Miles of Nowhere is SOLD OUT. Thanks to the 500 people who signed up! I don’t mean to boast (yes I do), but I’ve made it through the winter without gaining much weight at all. Maybe five or seven pounds. Maybe nine or ten at the most. Okay, I’ve gained eleven pounds during Winter. But compared to my usual annual weight gain / loss pattern, that’s practically like losing fifteen pounds. Practically. And so it was with no small amount of pride a few days ago that I, at the beginning of the South Suncrest climb, marked another rider so far ahead of me that I couldn’t even tell what color his (or her) clothes were. A veritable dot of a cyclist, on the mountain equivalent of the horizon. And then — this is the part in which I have pride quantified as “no small amount” — I caught, briefly chatted with, and then dropped him (for it was indeed a him). And I continued my ride, feeling strong. Feeling fit. Feeling like I am — as I have recently mentioned — a force to be reckoned with. My legs turning smooth circles, my arms applying exactly the correct amount of counterbalance to my downstroke, so that I ride a smooth, clean line. I was powerful, efficient. A cyclist in the prime of my life. Then, once home, I swung my right leg over the saddle (I always dismount on the left, though I’ve never considered why) clicked out of my left pedal, and was on the ground once more. And then I limped through my front door and up the stairs to my bedroom. Needing the rail, because I can barely walk. I stripped and turned on the shower, then attempted my “while the water heats up” ritual: doing sets of pullups. For today’s ritual, my sets were remarkably consistent: 0, none, and zero. This is because I have — once again — recently injured my shoulder, and it hurts too much to haul my weight up to the chinup bar. Cycling is popular with middle-aged people because it gives you the illusion of being in great shape, even though your body is completely falling apart. Cycling, by being no-impact on road and only moderate-impact on cross-country trails, gives you the sensation that you are whole and healthy. And why not? You’re climbing up mountains and flying down them, all under your own power. And the bonus is, if you’ve been doing it for a few years, your legs magically transform and you can — in spite of being middle-aged — show those young’uns a thing or two. And if you keep it up, you continue to improve, getting stronger and faster while everyone you know complains about getting slower and older. The problem — which I just recently banged my head against — is that cycling makes you fit within a tiny little narrow set of parameters. Specifically, cycling has made me very fit to turn my legs in small, smooth circles, under heavy load, almost indefinitely. And it’s made my arms — forearms, especially — very fit at counterpulling against the downstroke of my pedals, again, almost indefinitely. This kind of fitness translates, once I’m off the bike, to…um…nothing. As I mentioned before, walking hurts right now. Running is out of the question (which should make for an interesting Ironman in a month and change). And while my arms look toned — having done near-infinite low-effort reps — I am not the guy you want to help move your piano. And I’m far from the only example of this kind of pseudo-fitness. Take Kenny, for example. He looks strong, and on the bike he is nigh indestructible. Off the bike, however, he walks gingerly, and if you punch him in the arm, it will break. And the thing is, this illusion perpetuates itself. Off the bike, I’m human. OK, fine: subhuman. On the bike, I’m strong like bull. So, given an opportunity, where do you think I’m going to be? Is it weird for me to be all excited about riding 100 miles on my rollers on May 8? It is? OK, I kind of thought so. But I can’t help it. I’m excited. I’m excited because last year I loved the stories people sent in and I’m excited to read — and post — more of them this year. I’m excited because I’ve got awesome schwag for everyone, as well as some very cool “door prizes” a few people are going to be surprised with. I’m excited because this year we’re all going to watch a not-yet-available-to-the-public movie while we ride — and it’s topical and everything! Most of all, though, I’m excited because together we’re going to have a lot of fun and a little bit of suffering together while we raise a bunch of money for Team Fatty’s LiveStrong challenge. We’re having fun, getting schwag, getting a really hard workout, being ridiculous and giving cancer the finger — all at the same time. So if you already are sold and know what this is about, you can register now — here for men, here for women. Or read on for details. It’s a very strange thing where you pay $95 for the privilege of riding your rollers, trainer, or a very small course (like around the block) for 100 miles. And then the profits from your entry go to LiveStrong, to help them as they help people, worldwide, in their battles against cancer. I did the first annual one by myself, back before I knew it would be annual at all. The second one a bunch of us — from all around the world — did together, and people sent in their stories, many of which I published here. This year, the “official” date of the race is Saturday, May 8, and the time is whenever is convenient for you. And, thanks to the flexibility of the event — i.e., it’s just you, really — if May 8 doesn’t work for you, you can do it another day. Like in October, if you feel like it. And also, the “100 Miles” part is more of a guideline than a rule. For example, if you would rather ride 50 miles, that’s fine with me. So is 25. Or if you’re a runner and you want to do a marathon on the treadmill, that would be awesome. If you’re a swimmer, swim five miles. I’m not picky. And of course, the very best thing about the 100 Miles of Nowhere is that you are going to win your division. You just need to make sure your division is specific enough that there’s no chance anyone else is in it. For example, I’m pretty sure I’m going to win the “Middle-Aged Cycling Satire Bloggers Based Out of Alpine, Utah” division. In fact, I hope to dominate that category. I have mentioned, a time or fifty, that one of my most impressive superpowers is the ability to ask companies for stuff. I’m completely unashamed. And, as it turns out, when I have a good cause, companies are more than willing to help out. Yep, it’s true: most companies are full of people who like to do something good, and interesting, and unique. A Clif Bar, a package of Shot Bloks, and a package of Shot Roks: My love of Shot Bloks (except the Margarita ones) is well known. 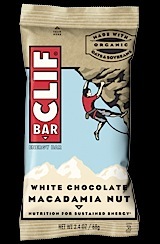 What I have not mentioned, however, is that I think the new White Chocolate Macadamia Clif Bar is incredibly delicious. Like, cookie-delicious. And the Shot Roks are the tastiest protein fuel-type food I’ve ever had. And I’m not just saying that because Shot Roks are the only tasty protein fuel-food I’ve ever eaten. Even though they are. The important thing is, Clif is coming out with energy food that you will — get this — actually enjoy eating. Which seems like a brilliant achievement, in spite of it being obvious. But if it’s so obvious, how come nobody else is doing it? DZ Nuts Sampler : A while back, I reviewed Dave Zabriskie’s Nuts. And I was glad I did, because that opened the door for a 4 sample packets of this taintastic chamois lube. As part of your 100 Miles of Nowhere Schwag kit, you’re going to get to get four sample packs of DZ Nuts, and you’ll probably want to use one of those sample packs during the event itself. Imagine: you’re going to get to liberally apply the same stuff to your chamois that Dave Zabriskie does. It’s like a dream come true. And then you should feel perfectly at easy making “taint” jokes for the next several hours. It’s your right as a consumer of DZ Nuts. CarboRocket : It’s kind of awesome having one of your best friends be a wild-eyed inventor and entrepreneur. It’s even more awesome when one of his ideas turns out to be really great. My friend Brad is this inventor, and CarboRocket is — without question — the best sports drink in the universe. 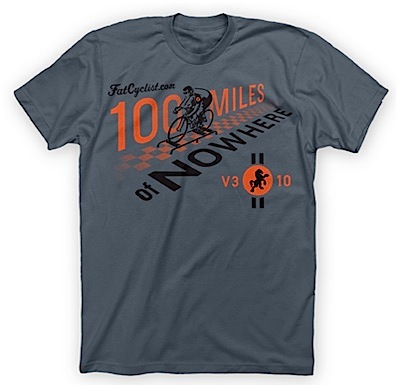 As a participant in the 100 Miles of Nowhere, you’ll get to try it out for yourself and see if you agree. I kinda think you will. You’ll get two single-serving packets of this all-natural, mild-tasting sports drink. And then you’ll wish you had more. 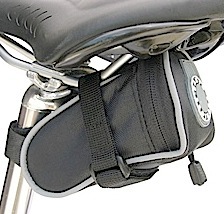 Banjo Brothers Mini Seat Bag: You know who the first advertiser I ever had was? You know who the first company that ever did giveaways with me was? In both cases, it was Banjo Brothers, a small company making great bags for cyclists. 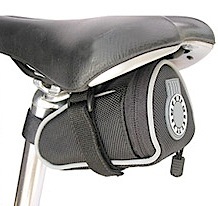 I have this Mini Seat Bag on every single bike I own — both road and mountain. You can fit a tube, a couple CO2 cartridges and adapter, a tire lever, and a small bike tool in there. And a couple of bills, in case you want to stop at a convenience store. It’s honestly about as perfect of an unobtrusive bike bag as there could be, by a couple of guys who ride bikes and know what cyclists need. Aspire : You’ll get an autographed copy of Aspire: Discovering Your Purpose Through the Power of Words , written by Friend of Fatty Kevin Hall, and published by Harper-Collins. Follow Kevin’s voyage of learning some words you probably don’t know, along with the deeper meaning of some words maybe you thought you knew. This is a book I think you’ll want to share. And also, you may want to spend a few minutes thinking about the fact that poor Kevin’s going to have to autograph 500 books. Which cracks me up, for some reason. Timex: A cap, to hide your helmet hair after the ride. And also to fool people into assuming that maybe you’ve done an Ironman or something. For once, let people’s false assumptions work in your favor. “100% Clean” Garmin-Slipstream Camelbak Podium Bottle : I have re-purposed all of my old bottles because I love the new Camelbak Podium Bottles so much. And while I normally ask you to buy one with my logo on it, if you’re doing the 100 Miles of Nowhere, you get a Garmin-Slipstream one for free. I love the way this team supports us in the fight against cancer. And I’m sure Lance does too. What Else Might You Get? Some super high-end backcountry snowshoes and poles from Easton Mountain Products. How will you know if you’ve won one of these door prizes? Easy. It’ll be in your schwag box. Expect more info on door prizes later this week. Registering for the 100 Miles of Nowhere is easy. Go over to Twin Six — this page if you’re a man, or this page if you’re a woman — and pick the size of T-shirt you want, then pay the $95 registration. In late April / early May, you’ll get your kit, and you’ll be all set to go. You can do this race anywhere: One of the nice things about 100 Miles to Nowhere is that it can be anywhere. I’ve had people ask me if they can do the race in Europe and Canada, and the answer is yes. Shipping might be a little more, and your schwag box may not get to you by race day, but that shouldn’t stop you from signing up. The race is capped at 500: The sponsors of this event have very real costs associated with this event, and since — mostly — it’s small companies sponsoring the 100 Miles of Nowhere, I need to assure them that they’re not going to have to come up with — for example — 2000 seat bags. So, once we hit 500 participants, registration is over. If we don’t hit the 500 participants, registration goes through March 28. You should know, however, that more than 150 people signed up before I even posted today’s entry, so I have a feeling this thing’s gonna fill up. I wouldn’t delay if I were you. Got a question? Leave it in the comments. I’ll answer it in comments — or if it seems like something a lot of people are wondering, I’ll update this post. This will be a lot of fun, and it will be very stupid, and it will do a lot of good. Thanks for racing nowhere for 100 miles with me! PS: If you’re a fan of Twin Six art and want to proclaim your 100 Miles of Nowhere loyalty on your computer, you’ll find a desktop-ready image here.